Arlingfant Elessedil was not mistaken when she thought the Ellcrys spoke to her. She is one of the Chosen â€“ those elves that tend to the great magical tree and spend their lives in service. But the Ellcrys has a bigger task for Arling and it is not one she is ready for yet, if at all. Arling must find the Bloodfire, and a way to escape her fate. Aphenglow, Arlingâ€™s sister, is once again searching through old druid records, this time to find a way to help her sister. She must return to Paranor and hope the druid keep holds the information she needs. In the meantime the Ard Rhys and the Ohmsford boys are still searching for the missing Elfstones and unbeknownst to Aphen are lost somewhere in the Forbidding. Bloodfire Quest continues from the very point where Wards of Faerie left off, which means the pace and tension that book one left behind are immediately taken up, propelling the reader back into events in Shannara. Evil and a sense of impending doom are at the forefront throughout and the danger feels more immediate than before. Arlingfant is a little more in the spotlight this time allowing the reader a better insight into her character and motives, and a bigger point of view cast overall immerses the reader far more into this world and the precarious situations its various characters are in.Â The pace does not let up from start to finish and this book is a prime example of what a great Terry Brooks story is like. 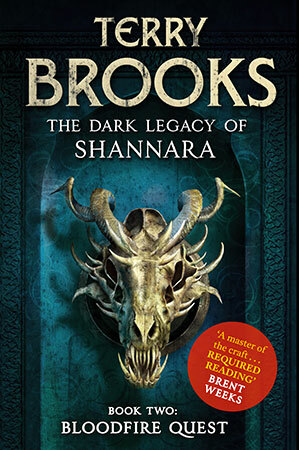 Shannara is still very much alive and rich in the details, creatures and magical possibilities that readers have loved over the years. The Dark Legacy of Shannara will conclude in book three, which is due for publication in Summer 2013, so thankfully there is not too long to wait for the conclusion to this episode.